I woke up sad and furious, my head screaming at Governor O’Malley for starters. How can he stay silent on Dominion Cove Point when the health and safety of citizens from Lusby to Myersville to western Maryland are at serious risk? When the health of the Chesapeake Bay and the economy that depends on it are at serious risk? What about all the pipeline and LNG facility explosions that have occurred in the past year? How can they be overlooked? It’s mind boggling. When there was interest in building an LNG facility at Sparrows Point in 2007, O’Malley kicked it to the curb. “Foremost among our concerns is safety of our citizens and the families who live in the community as well as those employed by area businesses,” he said. “We cannot dismiss the negative impacts this project will have on the Chesapeake Bay, as a treasured natural and recreational resource and significant economic engine.” He halted the project, opting instead for a renewable energy legacy essential to the protection of our water and air, our children and their future. How can he in good conscience not do the same for Dominion Cove Point? There are 2,365 homes within a two-mile radius of the LNG facility! It’s sheer madness to put fracked gas exports before the health and safety of citizens, natural resources and ecosystems. Sheer madness not to thoroughly analyze the amount of climate pollution LNG exports will generate. 400,000 people just marched in New York because we are at a precipice when it comes to the amount of greenhouse gases trapped in the atmosphere. We don’t have the luxury of setting in motion 20 years of exporting natural gas. We can’t handle the methane what will end up in the atmosphere as a result of this next wave of extreme fossil fuel extraction. And FERC is about to drive us right off the cliff. This coming from a child who is inheriting a future being destroyed by fossil fuels. My beautiful girl comforting me when I am striving to protect her. There are so many reasons why exporting fracked gas in southern Maryland – and in this country – is an absolutely foolish, irresponsible, short-sighted, and, yes, criminal act. I have written about the specifics again and again. But, for today, I mourn the news of approval, and I strengthen my resolve to stop the extreme fossil fuel madness. I do so for the children and future generations, who deserve to inherit a future that they can thrive in, not just survive in. I will not allow the proponents of Dominion Cove Point to “learn they have made a terrible mistake.” There is no more room for learning curves when it comes to endangering life on earth. 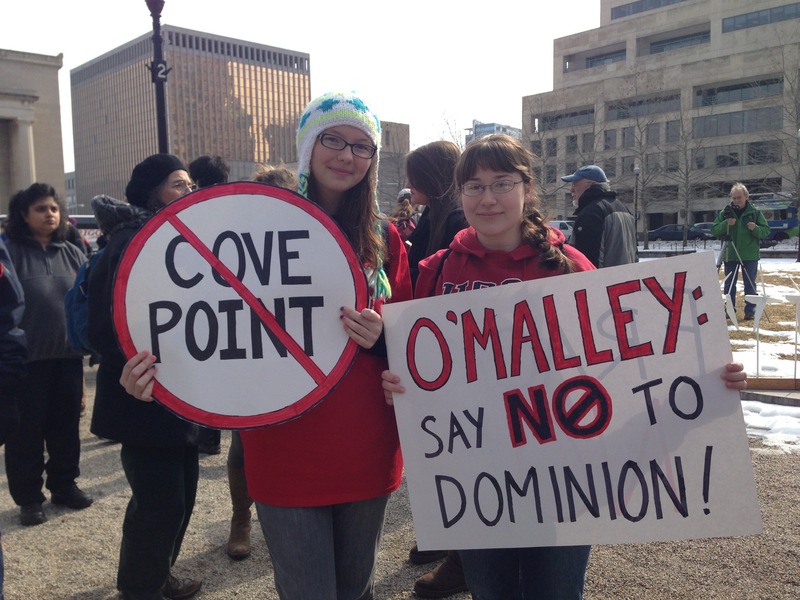 Click here to help stop Cove Point! This entry was posted in Children, Clean Energy, Dominion Cove Point LNG Terminal, Fracking and tagged Calvert Citizens for a Healthy Community, CCAN, Chesapeake Climate Action Network, climate action, climate change, cracked gas exports, Dominion Cove Point, Federal Energy Regulatory Commission, FERC, fracking, Governor Martin O' Malley, LNG exports, Lusby Maryland, People's Climate March, Stop Cove Point, Waterkeepers Chesapeake. Bookmark the permalink.